There are many agencies and organizations working in and around Broadway that provide valuable services to the industry and its audience. To help support your efforts to integrate theatre arts into your classroom, StageNotes.net has compiled a list of organizations that offer benefits to teachers and students ranging from discounts on tickets for shows and lectures, professional development programs, free e-newsletters and educational content. Although these organizations are located in New York City, teachers anywhere in the country can benefit from the information and materials they produce. Audience Rewards is the first national rewards program for the arts and the Official Rewards Program of Broadway. The company was founded by a unique coalition of prominent theatre owners (Nederlander, Shubert, and Jujamcyn), major national presenters, and key performing arts centers from across the country. Broadway Direct brings its readers the best of Broadway and theatre from around the country. With an inside view of the theatrical industry, and as a service of Nederlander Producing Company of America, Broadway Direct features interviews with theatre’s leading talents, sights and sounds from on stage and beyond, and a connection to the latest happenings from touring productions across the U.S.
GIVENIK is an exciting new way to get discount tickets, premium seats and group rates to Broadway, Off-Broadway shows and support your favorite charity! Check out our show listings for details on all the fantastic offers we share. Then browse our list of charities you can support – 5% of every ticket you buy will go to any one you choose! Don’t see your charity listed? Contact us for details on how to get started fundraising with us. Any certified non-profit can join us! More questions? Visit our FAQ – it probably has the answers you need! Have something to say? Email us – we always want to hear you! Whether it’s for one, two, three or seven days, each New York Pass is a sightseer’s ticket to some of the most popular tourist attractions in the City, over 55 destinations in total, including the Empire State Building, the Metropolitan Museum of Art, Circle Line Sightseeing Cruises, Madame Tussauds, New York Skyride, the NBC Studio Tour and the Statue of Liberty. Passes also entitle bearers to discounts at theaters and department stores, and are accompanied by a 180-page guidebook published in English, Spanish, German, French, and Italian. NYC & Company is New York City’s official marketing, tourism and partnership organization. Our mission is to maximize travel and tourism opportunities throughout the five boroughs, build economic prosperity and spread the dynamic image of New York City around the world. With the launch of major interactive initiatives—including nycgo.com and the Official NYC Information Center—NYC & Company becomes the ultimate resource for visitors and residents to find everything they need about what to do and see in New York City. Theatre Development Fund, a not-for-profit organization, was created with the conviction that the live theatrical arts afford a unique expression of the human condition that must be sustained and nurtured. TDF’s twofold mission is to identify and provide support, including financial assistance, to theatrical works of artistic merit, and to encourage and enable diverse audiences to attend live theatre and dance in all their venues. 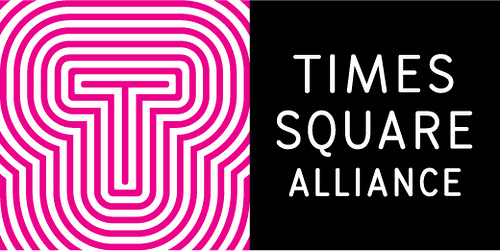 In addition to providing core neighborhood services with its Public Safety Officers and Sanitation Associates, Times Square Alliance promotes local businesses; encourages economic development and public improvements; co-coordinates numerous major events in Times Square (including the annual New Year’s Eve and Broadway on Broadway celebrations); manages the Times Square Visitor Center; and advocates on behalf of its constituents with respect to a host of public policy, planning and quality-of-life issues.